It's not always a bad thing when the plans you had for your days off get changed at the last minute. In this case it was the location where the hike was going to take place. On the way to the alternative hike, a mother moose and two calves were spotted. Most often a female moose will have one calf, but not uncommon for a cow to give birth to twins. For the cow there are big challenges trying to get one calf to survive through its first year, with twins even harder. Finding food is not the problem, but dealing with harsh winter and predators is. Moose populations and nutrition play a role if a cow will have twins. 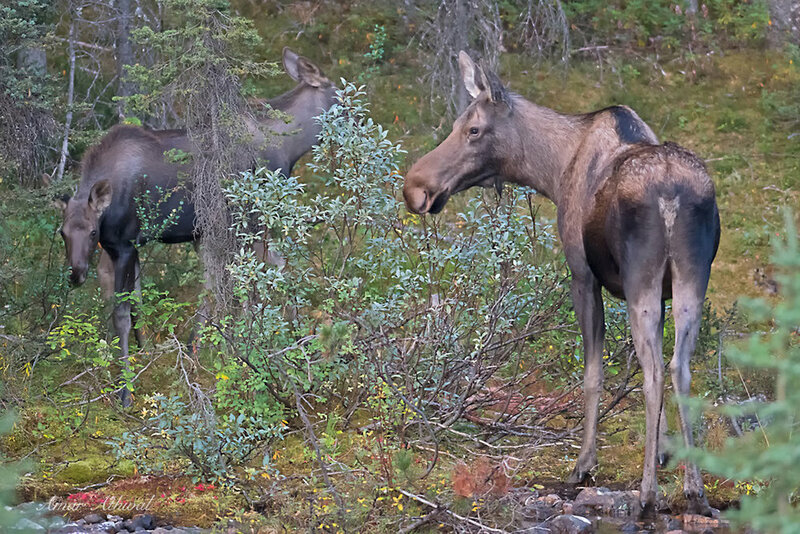 With better foraging area and lesser moose population, the chances are increased birth will be given to twins. On the day the picture was taken, the twins were busy eating and staying close to their ever protective mom.